Considering buying a KitchenAid stand mixer? With 20 different distinct model numbers, it can be difficult to compare KitchenAid mixers. 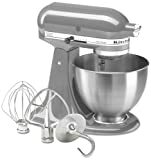 You will need to compare KitchenAid stand mixers across these model lines to find the best stand mixer for your needs. Using our KitchenAid comparison chart can help you narrow down your selection dramatically. Given the price ranges from $349 to over $1000, matching the mixer with your cooking abilities and desires becomes an important financial decision. To compare KitchenAid mixers, we spent over 45 hours researching information for this article – to help you! Note that if this is out of your budget range, you can still find a good stand mixer under $100. This is the most comprehensive KitchenAid mixer comparison review you will ever find – if you can’t choose which KitchenAid stand mixer to buy after reading this article maybe you simply aren’t ready! Which KitchenAid mixer should I get? Our extensive research and comparison of stand mixers will help you decide. Can you do us a favor, however? If you found our research helpful can you PLEASE share on Facebook and Pinterest using the buttons on the side? Thank you! We’ve tried to make it as EASY as possible to compare KitchenAid mixers so you don’t get lose in all the information available online. However – choosing the right KitchenAid mixer requires you to do a little homework. This article will give you the base information you need to make the right choice – and not overspend, or buy a cheaper model that will leave you frustrated in the end. However, there are differences in the various models you need to be aware of, and not all models of KitchenAid mixers are without reported problems by users. Leveraging the KitchenAid comparison chart data in this article should help you avoid some of the worst issues. Basic cooking needs like meatloaf, mashed potatoes, etc. Specialized recipes using mixer attachments – making your own pasta, sausages, ice cream, etc. Will your mixer sit on your counter all the time, or be stored and taken out only when needed? How important are color choices and matching your kitchen décor? Do you like to add ingredients throughout the mixing cycle, or only at the beginning? Is this for home use, or for commercial or semi-commercial baking and cooking needs? This is all about power and weight. Go with as much power as you can afford in this case. Do you prefer tilt-head or bowl lift style? Given the 20 distinct model numbers available for KitchenAid stand mixers, we broke down a large volume of information as part of our KitchenAid mixer comparison reviews. We recommend you start comparing KitchenAid mixers starting with price ranges, as this typically determines what models you will look at. Data listed throughout this article is extremely useful in assembling your own KitchenAid mixer comparison chart based on what is important to you as a baker or chef. In addition to basic product information and suitability based on your needs, we’ve also provided our opinion on how “good” each mixer is, based on reading thousands of reviews across multiple product sites (including Amazon and KitchenAid itself). Answering “which KitchenAid mixer should I buy” should be easy after reading our recommendations for the best stand mixer. Our goal is to enable you to compare KitchenAid mixers as quickly as possible based on your needs and budget. Coatings flake off attachments [whip, paddles, etc.] into your recipe. Glass mixing bowls – the almost universal feedback is glass bowls are heavy, prone to breakage, and due to their weight can be difficult to actually get attached to the mixer. We wouldn’t recommend a glass bowl right from the start. Mixing ability – if a particular model has large number of reports of attachments not reaching the sides and bottom of the bowl. Spending this kind of money on a stand mixer and having to stop and constantly scrape the bottom and sides of the mixing bowl is a waste of time, will result in inferior mixing results, and frankly isn’t what you are paying for. Note that all prices are based on KitchenAid list prices available as of September 2016. 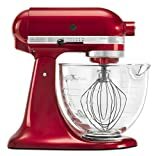 Often you can find stand mixers discounted both on Amazon.com as well as at local retailers, so you may want to choose a couple of candidate KitchenAid mixer models for comparison, and look for discounts on the higher priced one if it meets your baking and cooking needs better. The following list allows you to compare KitchenAid Mixer models based on price ranges – after all, why spend time reading about a mixer you can’t afford? You can click on each model number to be taken to the stand mixer review of that specific model for help choosing your ideal KitchenAid mixer based on our comparisons. You make large batches [4+ dozen cookies, 3+ loafs of bread] on a frequent basis. KitchenAid mixer comparison charts often ignore this commercial model, as it really isn’t meant for residential use. Given the price point, and NSF certification, you know this is an industrial strength kitchen mixer meant for mostly commercial food preparation. Many home bakers and cooks use this KitchenAid model if they are baking large batches of bread, cookies, pizza dough, and similar high production food items. Note that we found this commercial series KitchenAid mixer for less than $700 at many retailers, so be sure and check prices if you want a large capacity, extremely powerful kitchen mixer. When comparing KitchenAid mixers and bowl capacities, this is the only stand mixer we found that has an 8 quart bowl capacity, as well as a stainless steel bowl guard. With a 1.3 horsepower motor, .44 HP is delivered directly to the mixing bowl, making this one of the more powerful KitchenAid stand mixers you can purchase. Due to the high power and torgue this motor delivers, you will encounter less heat buildup or motor burnouts than with most other models. Note that only a few models of stand mixers are measured in horsepower, with the majority of mixer comparisons done using watts – keep that in mind as you compare KitchenAid mixers. Review Feedback: 95% 4-5 star ratings on Amazon (highest we have seen for a KitchenAid Mixer). Our evaluation: Excellent buy. If you have the money, space, and need for a high capacity kitchen mixer, this is the one to get. If wondering which is the best KitchenAid mixer to buy, this one is likely the best IF you need the power and capacity and are find with the mixer price! Rated a moderate buy in terms of quality, capability, durability, with some issues around food contamination and motor/attachment failure. In our KitchenAid mixer comparison, this stand mixer has the same amount of power as the Commercial series, at 1.4 HP. It’s 7-qt bowl capacity is a little less than the Commercial series, but is still fully capable of making up to 14 dozen cookies in one batch, and has a 16-cup flour capacity. It comes with a stainless steel bowl with a handle that is dishwasher safe for easy cleanup. KitchenAid states that this is the largest capacity residential mixer available on the market (as of 2011 based on their information). With a direct drive transmission and all steel gears, it is built for heavy mixing loads and years of dependable service. Our Evaluation: Moderate buy – not our top choice. Motor failure, odd noises, and food contamination reports concern us, although these could be issues related to a few defect units. The longer warranty may give you peace of mind, but we would recommend spending a little more and getting the KitchenAid Commercial series if you’re worried about the issues other reviewers have noted. You make large batches [13 dozen cookies, 8 loafs of bread] on a frequent basis. Rated a possible avoid due to experiences with the glass bowl and mixing ability. At 1.0 HP, comparing this KitchenAid mixer to higher end models note that it has a slightly less powerful motor. Most buyers love that it comes in metallic colors, which are vibrant and add a distinct touch of style to any kitchen. At 6-qt capacity it can handle most needs of the moderate baker/cook, but is 2 quarts shy of the Commercial series which can occasionally be found on sale for not much more than this model. In reading stand mixer reviews and comparisons across multiple sites, two large complaints surfaced over and over, which lead us to not recommend this mixer given the price tag and better choices in other KitchenAid mixer models. It is also listed as weighing 37 pounds, which is very hefty and will be challenging to move around frequently. Flat beater, spiral dough hook, wire whip. Powerful and heavy. Can leave unattended and not worry about it wondering around your kitchen. Our Evaluation: We would pass. While super attractive in design and colors, the issues mixing with the included glass bowl, and the fact that it has a glass bowl, are enough to have us pass on this one. Many reviewers reported that replacing the glass bowl with a stainless one [and getting stand mixer attachments specific to that mixing bowl] resolved most of the mixing issues with ingredients left in the bottom and on sides of the bowl. You like the tilt head design of easy access to ingredients and quick addition of ingredients during the mixing cycle. You prefer unique, metallic colors not found on most other models. You do a moderate amount of baking and need a capable, long lasting mixer with capacity for multiple loads. You won’t tend to move it back and forth from a cabinet, given it’s weight of 27 pounds. Note that at the time of this article, in deciding which KitchenAid mixer to buy the price may not be a barrier, as it could be found up to $200 off list price on Amazon, although the pricing did vary by color [the Copper KitchenAid stand mixer tended to be more expensive]. When comparing KitchenAid mixers, note that this mixer is part of the Artisan line of mixers. It shares many of the same characteristics of other Artisan mixers with the key difference being the specialized finish. This tilt-head mixer offers a stainless steel mixing bowl with an integrated handle, and provides 59-point planetary mixing action – basically touching 59 points around the bowl on every rotation to ensure even and complete mixing. At 325 watts it is not the most powerful mixer in the lineup, but provides more than enough power for common small-medium load mixing. This stand mixer has the capacity to handle 9 dozen cookie recipes, as well as 4 loaves of bread and 7 pounds of mash potatoes. Flat beater, dough hook, professional wire whip, pouring shield with chute to add ingredients. Colors available: Satin copper, chrome, brushed nickel. Warranty: 1 year hassle free. Some owners reported problems keeping the Copper finish clean and tarnish free. In general this KitchenAid mixer doesn’t have nearly the volume of reviews other models do, and the reviews that are available on multiple sites all are fairly positive. To compare KitchenAid mixers you have to consider if the model and color scheme is worth the other trade-offs shown. Given that it is an Artisan mixer with specialized finishes, we would expect it perform identically to those base models. Note that you are paying a premium for the specialized metallic finish on this kitchen mixer, so in stand mixer comparisons this KitchenAid will not win on price relative to other Artisan mixer colors. The one thing to watch for is if you decide on the Copper finish there are numerous reported problems with tarnishing and black spots developing on the finish. This mixer is worth spending the money if you want the metallic finish as part of your décor. Our Evaluation: A solid, hefty and likely long lasting KitchenAid model. Premium price in some cases for the satin copper finish, and keep your eye on the finish if you go with the copper mixer. You prefer a bowl lift mechanism over a tilt head mixer [can use while sitting under a cabinet]. You prefer a glass bowl over stainless steel and are ok with the weight and potential for breakage. This mixer doesn’t skimp on capacity, being capable of handling 13 dozen cookies and 8 loaves of bread. At 550 watts it is on the higher end of power for a stand mixer, and is capable of powering through virtually all residential style recipes and volumes. With this power and capacity comes weight, however. At 34 pounds you will struggle moving it around your kitchen frequently. When choosing which KitchenAid mixer to buy based on reviews, keep the weight in mind. You won’t want to use a stand mixer if you can’t even get it positioned right on your counter, or moved out of the cabinet. Coated flat beater, coated spiral dough hook, and 6 wire whip. 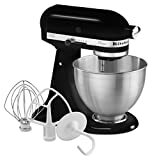 Note that the KitchenAid corporate web site lists 3 colors (underlined above) as being available for this mixer, while on Amazon and some other shopping sites there are many more as shown above. We believe some sites may have the “600 Series” and “600 design series” confused with respect to color selection. Like other glass bowl based mixers, numerous complaints about poor mixing ability, ingredients in bottom not mixed in, and significant bowl scraping required. The glass bowl is heavy, can be difficult to attach, and frequent scraping means you are moving the bowl a fair amount. Some complaints about the mixer being a bit noisy. Plenty of power and stability given its weight. Our Evaluation: We would Pass on this mixer. The mixing ability is a show stopper for us, and although some owners were able to replace the glass bowl with a steel one, you shouldn’t need to do this on a mixer that is in this price range. You need extra mixing power for larger cooking projects and you mix frequently. Continuing our mission to compare KitchenAid mixers – As with many of the KitchenAid stand mixers you can choose from, the price on this stand mixer is frequently found to be at prices up to $200 less than list price, so be sure and use actual pricing as your guide versus list price when deciding whether to buy this KithenAid stand mixer. At 575 watts, and direct drive transmission with all metal parts, this mixer is strong, durable, and will likely last a long time. It is a fairly massive piece of kitchen machinery, so be sure you have the space and need the weight and power of this mixer before purchasing! It is definitely targeted at a frequent, heavy duty cook. Looking at KitchenAid mixer comparisons, choose this one if you prefer the 67-point planetary mixing action which virtually guarantees a complete mixing job on all of your recipes. With the power and capacity noted above, this stand mixer can easily handle 13 dozen cookies or 8 loaves of bread. Burnished aluminum metal flat beater and spiral dough hook, and 6 wire stainless steel whisk. Our Evaluation: Proceed with caution. We like the power and weight of this mixer, and it is built for heavier, frequent mixing recipes. However, the discoloring in food caused by the aluminum beater and dough hook are cause for concern. There are a very large number of positive reviews across multiple sites, so we feel this is a very solid, heavy duty mixer that may have some quality control issues with their attachments. We are going to skip a full review of this mixer as it is basically fairly equivalent to the KitchenAid Artisan line of mixers, with the exception of the glass bowl. You should have all the info you need to compare KitchenAid mixers against this model elsewhere in this article. All previous caveats around glass bowls apply here with some issues with mixing ability, weight of the bowl, and of course it is glass and can be prone to breakage. You need moderate power without going to a “professional” mixer. Note: At the time of this article, we found many Artisan colors for sale under $300.00, so be sure to shop around and not rely on the list price as your budgetary guide. The Artisan stand mixer is the most popular of all stand mixers and is a frequent choice when choosing which KitchenAid mixer to buy. With literally over 10,000 reviews posted online across multiple sites, it is easy to see why most light to moderate bakers and residential “chefs” have one of these mixers sitting in their kitchen. It has a almost perfect blend of power (325 watts), size, weight, and mixing ability. With a large number of colors available for this stand mixer, it will suit almost any kitchen décor. At 26 pounds it isn’t the lightest mixer, but it is easier to move around than many other models while not sacrificing stability during mixing. The stainless steel bowl with integrated handle is super functional, and 5-quarts provides plenty of capacity to handle 9 dozen cookies or 4 loaves of bread. The tilt head design is preferred by many cooks over the stand lift due to ease of use and avoiding any issues attaching and detaching the bowl. When comparing KitchenAid mixers the bowl type and stand lift versus tilt head may one of your key criteria – so think about your needs here. While the Artisan models “only” have 59-point planetary mixing action, we think this will be more than sufficient to ensure fully mixed ingredients. Comparing the Artisan against other KitchenAid models will illustrate the blend of power, mixing ability, color selection, and weight that meets common residential needs. Coated flat beater, coated dough hook, 6-wire whip, and a pouring shield. Colors available: Almond cream, aqua sky, blue willow, Bordeaux, boysenberry, buttercup, canopy green, caviar, cobalt blue, cocoa silver, contour silver, cranberry, crystal blue, empire red, espresso, French blue, gloss cinnamon, grape, grass green, green apple, ice, imperial black, imperial grey, lavender cream, leaf, liquid graphite, majestic yellow, matte pearl white, metallic chrome, ocean drive, onyx black, pear, persimmon, pink, pistachio, silver metallic, tangerine, twilight blue, watermelon, white, white on white, empire red. Highest rated KitchenAid model we looked at – across multiple online sites. Our Evaluation: Favorite buy for most residential baking needs. Excellent blend of quality, power, weight, color choices, and durability for the typical baker. We did not do a full review of this KitchenAid stand mixer – primarily because based on all information we could find it is essentially an Artisan Series mixer offered in a Cocoa Silver matte finish. It is part of a named series of appliances from KitchenAid that includes a dishwasher and refrigerator among other appliances. It can easily be assessed with our other data when looking to compare KitchenAid mixers. It also has the same list price as any other Artisan series stand mixer ($429.99), and when you view it on merchants sites it does show up as simply a color option for the Artisan series in many cases. You don’t need a tilt mixer and like a bowl lift. You have medium-heavy sized baking and cooking needs. Planetary mixing action is not a requirement [e.g. normal mixing action is fine]. You plan on frequent use with heavy batches – this is a powerful mixer. This mixer is a bit of an anomaly in the KitchenAid line of mixers. It is priced fairly reasonably given the quality and power. It has a 475 watt motor [more powerful than the artisan], and weighs 30 pounds. When comparing where to buy KitchenAid mixers, however, it can be a bit hard to find. What is interesting is there are very few online retailers that carry this model. The oldest review we could find was from 2013, so this isn’t a 30 year old mixer. For the price you get a ton of mixing power, stable at 30 pounds, and a direct drive transmission with stainless steel gears, and is all-metal construction. In short – a solid, brute of a machine. We believe [not proven] that this mixer is priced fairly low is due to the fact that it is offered in only two colors, and it doesn’t offer the planetary mixing action like the Artisan and other recent mixers from KitchenAid do. Spiral dough hook, flat beater, stainless steel wire whip. Colors available: Empire red, onyx black, possibly cobalt blue. Warranty: 1 year hassle free replacement. This model is not consistently sold on Amazon– thus insufficient review information to report. 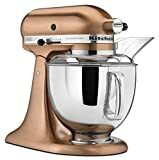 KitchenAid.com has over 1,300 reviews for this model, with a 4.8 our of 5 stars [one of highest review ratings and comparable to the Artisan reviews]. We found very few consistent issues reported with this mixer. Our Evaluation: Good buy if you can find one, and don’t need planetary point mixing action. One of the more powerful, well built mixers in this price range. At 26 pounds, this mixer is essentially equivalent in terms of weight and overall size to an Artisan mixer. The 4.5 quart stainless steel mixing bowl has enough capacity for 6 dozen cookies or 3 loaves of bread, so it is on the smaller end of many other KitchenAid mixers we’ve reviewed on our site. It has a 59-point planetary mixing action, which ensures your ingredients are mixed very thoroughly. At 300 watts, it is 25 watts less than the Artisan – which makes us scratch our heads as to why it is called the Ultra-power. Burnished metal dough hook and flat beater, 6 wire whip. This mixer reviewed 4.8/5 stars from over 725 reviews on KitchenAid.com. Some reports of the powder coating coming off the attachments – primarily after putting the mixing paddle through the dishwasher. Some reports of motor burnout when doing bread recipes. Ingredients can spatter out of mixer. Our Evaluation: Proceed with caution. The coating issue with the attachments and some reports of motor problems with denser bread batches has us a little concerned. If you hand wash attachments and don’t make a lot of bread this machine may be perfect for you given the price, power, and smaller bowl footprint. As with other models of KitchenAid mixers we reviewed here, the actual market price for the Classic series can be up to $100 lower than the list price shown above. In one case we found this mixer for under $200 brand new. We would classify the the KitchenAid Classic Mixer as an all-around, versatile, and economical home mixer. At 250 watts of power, it can handle just over 3 loaves of bread, and about 6 dozen cookies. It is not a powerhouse, yet has sufficient power for most common residential stand mixer needs. For years it was the gold standard that others used to compare KitchenAid mixers against their models. With dishwasher safe attachments (flat beater and dough hook), planetary mixing action, and a stainless steel mixing bowl, this is an all-around good mixer. Not great in any one category, and not suitable for heavier duty mixing needs – but more than adequate for most kitchens. The only significant drawbacks concern fashion and weight. This mixer is limited to just two colors [black and white], and at 25 pounds it is not the lightest or heaviest mixer. 25 pounds can still be hard to move around frequently, so this is still not a mixer you want to store in a cabinet as you will likely dread moving it every time you want to bake or cook. Attachments included: Coated flat beater and dough hook (dishwasher safe), 6-wire whip. A small percentage of users reported issues with oil leaking out of the attachment head – we could not find consistent reports of this. Our Evaluation: Good all-purpose light duty mixer. A few negative reviews out of thousands about oil leaks, but we feel this is your best value for an all-around, light load mixer that should last a long time, is easy to clean, and won’t break the bank.